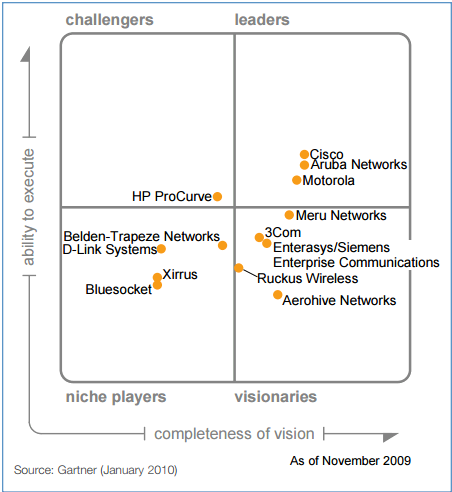 Gartner’s Magic Quadrant for Wireless LAN Infrastructure has been released for a couple of years. This post listed all reports found from Internet since 2010. If you are not familiar with this research publication or Gartner, please see graphic below. Gartner places vendors in one of four quadrants – Leaders, Visionaries, Niche Players and Challengers based on their score system. Gartner has named Cisco, Aruba (HPE), and Extreme Networks as the leader in the Magic Quadrant for Wireless LAN Infrastructure on July 2018. 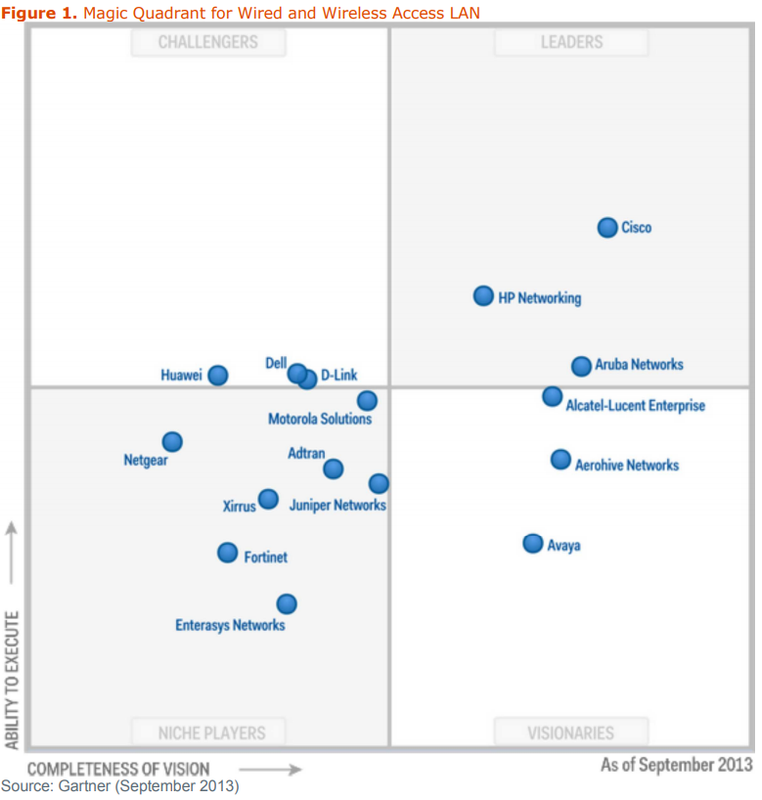 Still Cisco and HP dominate the market. No changes on Leaders Quadrant. Fortinet got into challenger. HP spent $2.7 billion to buy Aruba on March 2, 2015. Huawei becomes challengers. 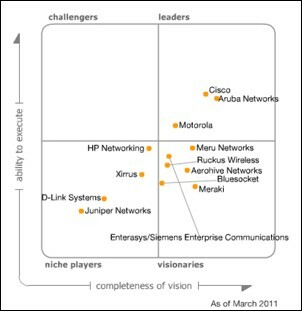 In Gartner 2014 June's Magic Quadrant for Wired and Wireless LAN Infrastructure report, for the 3rd year in a row, Cisco, Aruba and HP Networking are positioning at Leaders quadrant, which are same as last two years. On May 19, 2015, HP completed the acquisition of Aruba Networks for a transaction value of $3 billion. In Gartner's 2015's report, there will be only two vendors showing in the Leaders quadrant. Huawei, Dell and D-link lost their challengers position and become niche players. Aerohive, Acatel-Lucent Enterprise, Ximus and Avaya are in visionaries quadrant, which means they have innovated in one or more of the key areas of access layer technologies within the enterprise (e.g., convergence, security, management or operational efficiency).